"Functional gut" symptoms (bloating, wind, abdominal distension, discomfort, pain, altered bowel habits) can be controlled by diet, but most theories of how exactly food components are linked to symptoms are lacking consistency. In 2005, Peter Gibson and Susan Shepard gave us food for thought by defining highly fermentable but poorly absorbed short-chain carbohydrates and polyols as an important dietary factor contributing to these symptoms ( see their original article that coined the term FODMAPs - Fermentable Oligo-, Di- and Mono-saccharides And Polyols). Their studies of different patient groups (Irritable Bowel Syndrome, Irritable Bowel Disease, celiac disease, fructose malabsorption, patients who underwent colectomy, etc) showed that reduction of the intake of FODMAPs may help to reduce symptoms, depending on other things these people usually eat. There is a cumulative effect of these foods, of their osmotic (water moving) and fermentative (bacteria feeding) actions, on IBS symptoms such as abdominal pain, bloating, gas, altered bowel movements and lethargy. Irritable Bowel Syndrome symptoms could result from many different (and independent) reasons including low absorptive capacity of the small intestinal epithelium, increased sensitivity of the bowel, rapid transit through the small bowel, and bacterial overgrowth in the distal small bowel. This means that you may eat some of the problem foods listed in the tables and still fill fine. It's not about the foods eaten in isolation, it's about hundreds of food components that are adding up. To follow the right diet, you need to identify your individual sensitivities and dietary combinations. For informational purposes only, we are listing candidate dietary components contributing to osmotic load and rapid fermentation thus increasing luminal pressure and distension, along with common high and low FODMAP foods - as listed in scientific publications. 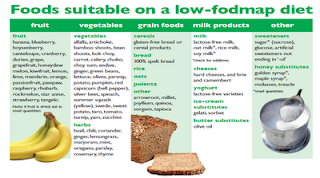 Red and green tables were compiled by a FODMAP-sensitive IBS sufferer based on his own experiences - check his post: "Printable FODMAP Diet Chart for your Convenience". Another FODMAP list compiled by trial and error can be found here. • Limit to 1 to 2 servings per day. • Fresh or fresh frozen fruit may be better tolerated than canned fruit. • Keep in mind tolerance may depend on the amount you eat at one time. • Avoid eating large amounts of any fruit. • Limit to 1 ½ to 3 servings per day. • Cooked vegetables may be tolerated best as cooking causes a loss of free sugars. 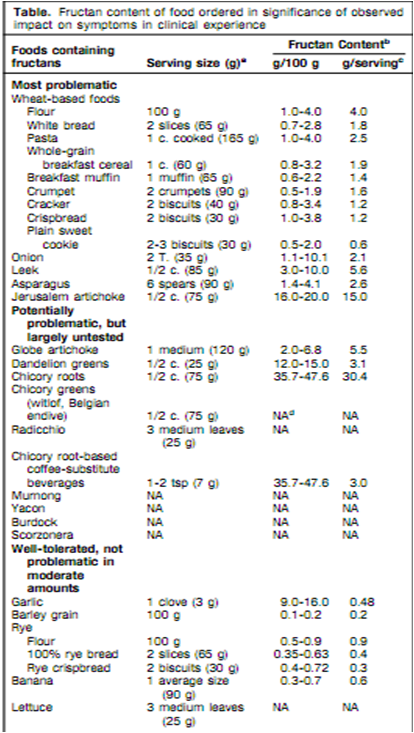 And here are two more tables with foods already listed above, just to show why they are problematic for FODMAP-sensitive people. Note that some of the foods listed as intestine friendly may be less friendly for some people inducing functional gut symptoms. 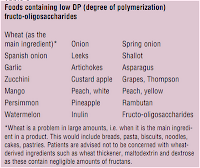 Inulins - often included in prebiotic supplements - are longer chain fructans thus are expected to be more intestine-friendlier than fructans with low degree of polymerization. Yet inulins often lead to increased wind. Gibson PR, Shepherd SJ. Personal view: food for thought--western lifestyle and susceptibility to Crohn's disease. The FODMAP hypothesis. Aliment Pharmacol Ther. 2005 Jun 15;21(12):1399-409. Review. Gibson, P. & Shepherd, S. Evidence-based dietary management of functional gastrointestinal symptoms: The FODMAP approach. Journal of Gastroenterology and Hepatology 2010 25:252-258. Rangnekar AS, Chey WD. 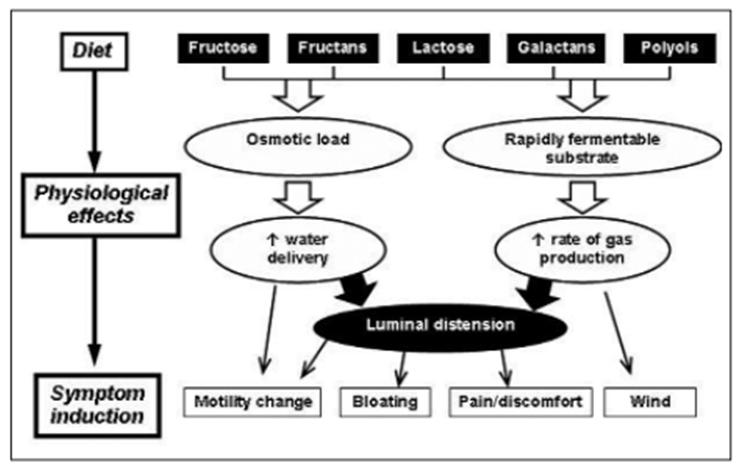 The FODMAP diet for irritable bowel syndrome: food fad or roadmap to a new treatment paradigm? Gastroenterology. 2009 Jul;137(1):383-6. Epub 2009 May 29. Does the FODMAP Diet Help IBS? It's good to see more information about FODMAPS getting out there. 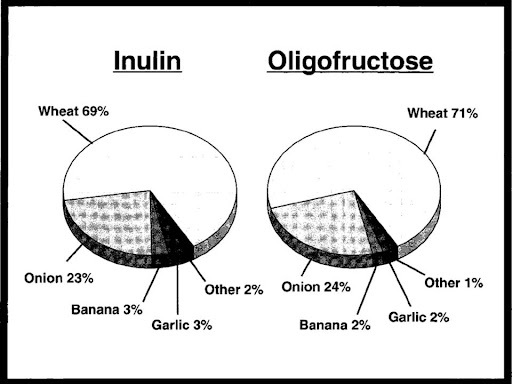 Another good source of info not on your list is the yahoo group 'fructose malabsorption australia'. Thanks for your comments! 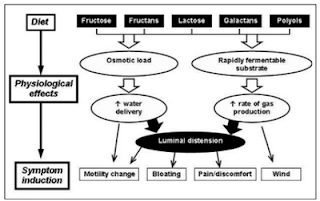 The fructose malabsorption support group is now included in the list here. A new blog will tell more about fiber. I would like to use one of these charts in my research paper for my biology class but I need to be able to site it properly. 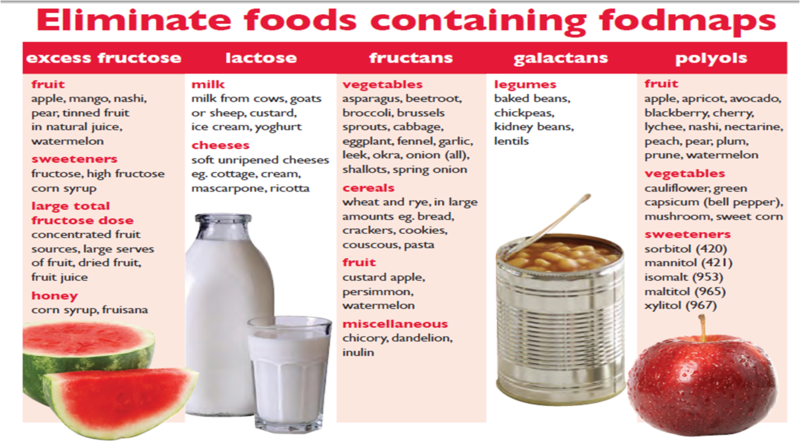 Can you tell me where to find the red chart "eliminate foods containing fodmaps" in it's original place please. Irritable Bowel Syndrome Self Help and Support Group, March 26, 2011. Hey, good compilation of resources all in one place. Thanks! At this exact moment, my husband is drinking "the drink" to prepare for a colonscopy he is getting tomorrow. My point is, he has been diagnosed with IBS and has a history of colon cancer in his family. And even still, refuses to eat more fiber...because it makes him "go" more. I'm afraid he falls into the majority of the population that does nothing but contribute to more diseases and health issues by eating fast food and refined carbs. His father has type 2 diabetes and only recently is he starting to acknowlege that he needs to start adding fiber to his diet. I appreciate your article and really like the chart. It will just back-up my research to get him on the fiber boat. As to whether aspartame safe during pregnancy is still a problem with information I have yet to digest as there are so many conflicting information on the web. Michelle, you may want be careful before pushing your husband towards more fiber. After a year of suffering my doctor told me to cut back on that, and it helped greatly. Not everyone is the same. Some of us don't tolerate it well. Michelle, you may not want to push your husband toward more fiber. It is not good for every single person. In my case, I had a year of suffering until my doctor figured out that fiber was actually the problem. Not everyone handles it well. The colonoscopy is what will protect him. After getting these diets from FODMAP, I feel myself healthier and lighter. These diets are a great alternative to detoxifying. Some deem maintaining a diet as a hassle so they take other procedures like colon hydrotherapy south melbourne. But for some of us who still have the will, taking a high fiber diet wouldn't be much of a trouble. Our long island weight loss program have showed this diagram to us and I must say, it's a great guide to staying fit and healthy. I recently found out that some of these diets aren't really the way to go when you're having the best work out supplement but I guess it would still be better if you consult a dietician. 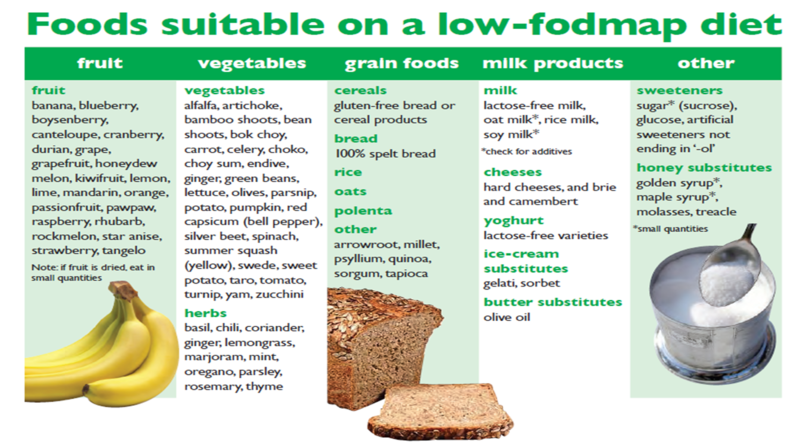 "Reduction of the intake of FODMAPs may help to reduce symptoms, depending on other things these people usually eat." - This makes perfect sense. Your food intake directly affects your health, moreso in the abuse of certain food types within FODMAP. What can help you out though is excercise - which not all people give a much credit to. I break my bones and stretch those muscles as hard as I can, then take sierrasil to relieve myself from it. No matter where you look at it, your health - and figure - relies on your actions, or lack thereof. Do you have a diabetic friendly diet? I want to give a list of food that my mother can try because she is bored with meals that she cooks for herself. When I'm buying food products, I always make it a point to check its nutritional facts. This is to make sure that what I am going to buy is good for my system. Hi everyone! I've been doing a research now about artificial sweeteners like aspartame because, my wife is an expectant mother. I really want to know if taking aspartame is safe during pregnancy? This is the kind of information everyone of us should read and to take note of. Knowing this info will prevent us from getting into any trouble. Natural remedies to help normal bowel movement are various fruits and vegetables. If that doesn't work, then it's the only time one should go after health products. But as much as possible, doctors wouldn't advise that. They would stick to the all-natural remedy instead. That is the reason why I always make it a point to read first the product label before buying it. This is to make sure that what I am buying is what I need for my health. One way to regulate bowel movement is through a good exercise. Everyone needs body movements that can help proper circulation of blood flow, breathing and proper waste movement. Prepare for diet and meal plans that include high-fiber food and less saturated or trans fat. In short, start living healthy! I've been having problems with my bowel movement last week. My doctor said there's something wrong with my diet, so he referred me to a nutritionist. I was advised to take more fluids and fiber-rich foods. As usual, it's what works for everyone. Once it happens, I just a generic anti-motility at the drugstore and go for a basic porridge to sustain me through the day. It's important to hydrate yourself, too. There goes another reason to keep up with the fruits and whole wheat bread. Too bad milk and apples have been listed as FODMAPs; if it so happened that I had stomach problems, I'd had to drop the apples entirely. If 'grape' is friendly and 'grapes' are to be avoided, does that mean that one grape is OK but not more? Good point! Grapes are usually listed as FODMAP-friendly fruit, but in most cases tolerance threshold is only 10 grapes or less. It's clarified now. Elecwire offers a unique Diabetic Socks Diabetic Socks to control blood sugar levels and its side effects. shop online diabetic socks for experience and treatment with free shipping and COD. 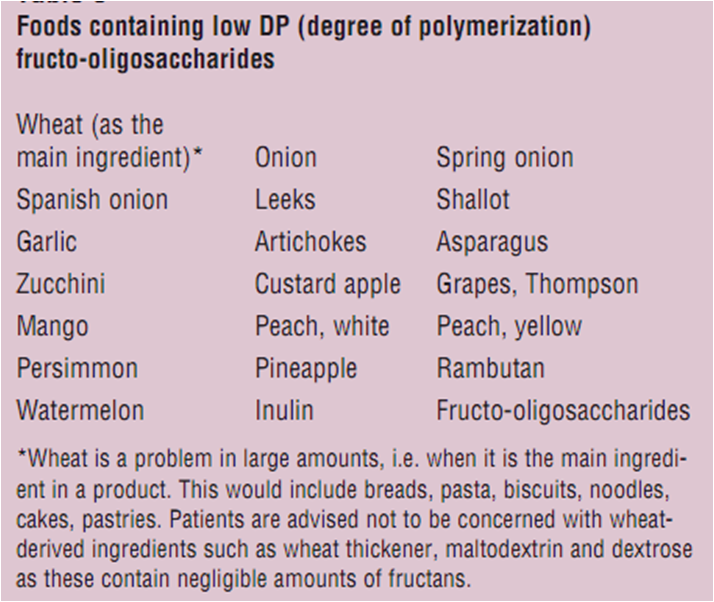 I was wondering as it doesn't specifically say butter in the foods to eat or not eat columns, what should/could I eat instead of butter? I recently read a number of articles on how bad margarine was for you so we switched to butter but now I've been diagnosed with either IBS or Messentary Panniculitus and have been told to go on this low FODMAP diet. Business development strategy online is the world's leading Marketing Platform - providing marketing strategy and business development strategy to small and medium businesses worldwide. TruOmega Clinically shown to support heart health.Clinically shown to support the body's natural anti-inflammatory response. Supports healthy triglyceride lev. Make your diet food chart that how much protein or vitamin will be there. I am impressed with how you have explained FODMAP diets. I'll take this in consideration because as of now, I am reading best power pack review. This is the website I have been finding for 2 months, many thanks. iam very nice pretty good post . Review Crazy Bulk and enhance your body building efforts. A recent review of studies found that nutrients are generally similar in comparable fresh, frozen and canned fruits and vegetables. Weight training programs, workout routines, exercise pictures and descriptions. Train with heavy loads one month, using sets of four to six reps. The next month, go lighter and stay in the 10-12 rep range. The heavy training allows your body to top steroids Australiamake even faster gains during the lighter weeks. Very interesting article. I am on FODMAP diet. My question is, can I take testosterone boosters while im on FODMAP diet? I have recently purchased Testogen testosterone booster from website Toptestosteroneboosters.org as I feel my testosterone levels are somewhat lesser. It is necessary to make the diet plan for healthy life. This article provides detailed diet plan which is very handy for everyone who is conscious about his/her health. I highly recommend you continue on the following superb deliver the results plus I actually look ahead to extra within your magnificent content. That being stated, this assessment would like to introduce you to a product that can be capable of offer NutraPure Fungus Clear you with the relaxation that you need for premier health. Our feet are probably the least most cared for parts of our body and are expected to work in carrying us over many miles all year round and there are a few basic things that we can do to keep them in good working order. Most people ignore their feet until there is a problem or particularly for women, if they are changing from enclosed footwear in the winter to summer sandals. I am a dietitian and I love Fodmap diet. Its one of the best and risk free way to lose weight. I have suggested this diet to many of my friends. My question is, can I use weight loss supplements like Phen375 or PhenQ while I am on FodMap diet? An ounce of prevention is worth a pound of cure and if you understand - nutrapure fungus clear - beforehand the cause of toenail fungus then you can take measures to prevent yourself from becoming infected. Integrating little steps into our daily routine and life to achieve and maintain a flat belly. The sole I just stumbled upon at is really solid. Regards! I always had problem with my intense and I had found that same fruits irritate it. This post has a completed list of foods that I must avoid. Thank you. It's not, but there are a bewildering number of choices for diets out there. High fat or no fat? High carbohydrate or no carbohydrate? Low protein or high protein? To make matters worse, there are a million variations and combinations to the above Flat Belly Fix Review diet scenarios to add to the confusion. It seems endless and causes many people to throw up their hands in frustration and give up. In this article I will attempt to change all that. Prescription of any item is quite crucial and also it's the crucial thing so as to attain the important objective. phenqguide.com has various tutorials related to Phen24 Review - 2 in 1 Diet Pills. i need a Loans Today Online payday loans is Very Fast Website. Exercise must be a part of any fitness center for girls strategy. You don't need to exercise all of the opportunity to reap the bodyboss reviews exercise. Add in some immunity work like free weights and involving eating healthy and exercising you are going to be on your way to a healthy body. Stop searching for alternative cb1 weight gainer in stores solutions, when the makers of https://weightgainofficial.com offers you 100% Satisfaction Guarantee. Thank about this Post, Visit jillian michaels body revolution for more info. Velez, Valeria . 2018. “PhenQ estudios científicos: El Pastilla Natural Para Adelgazar.” Adelgazaroficial.Com Ie. Adelgazar Oficial. Accessed November 8. https://adelgazaroficial.com/phenq/.